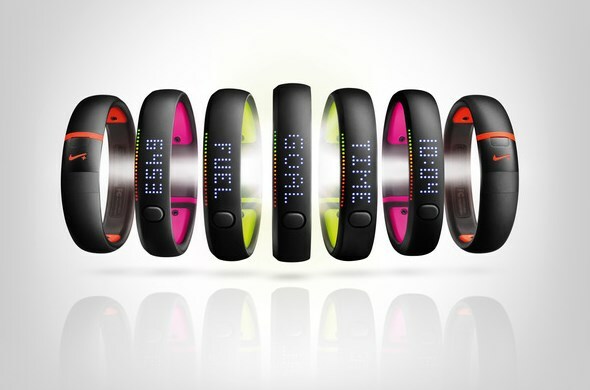 Earlier today, Nike have unveiled yet another device under its long-running Nike+ digital fitness series that is called the Nike+ FuelBand SE. As the name implies, the new wristwatch-like device is essentially a follow-up to the Nike+ FuelBand that the company released last year. A follow-up it might be but the functionalities on the new Nike+ FuelBand SE are almost identical to its predecessor since the main set of data that the FuelBand SE tracks are just like the original FuelBand: NikeFuel (the company’s own universal fitness metric), calories, steps and time. However, Nike did add three more functionalities into the device which are the ability to mark a specific set of activities using a feature that is dubbed Nike+ Sessions, periodic reminders called “Win The Hour” and simpler gesture (double tap) to display current time on the device. In terms of the design, FuelBand SE also generally looks identical to its predecessor with the exception of additional colour accents on certain parts of the device. That being said, Nike have pointed out that the FuelBand SE does come with Bluetooth 4.0, improved water resistance and redesigned circuit board for better flexibility. Meanwhile, a number of other improvements that the new FuelBand SE adds to the whole Nike+ FuelBand experience are actually not on the device itself. Instead, they are made available through an updated version of Nike+ FuelBand App for iOS devices such as the ability to track the amount of NikeFuel earned per minute and social sharing through Nike+ Groups. Given the fact that the original FuelBand was not officially released in Malaysia, it is pretty doubtful that the new Nike+ FuelBand SE will actually be made available in our market. Nevertheless, the price tag is similar to the original FuelBand at USD 149 (RM 473) if you are interested in getting your hands on a unit from United States starting from 6 November. The updated Nike+ FuelBand companion app for iOS devices will also be released at the same time.